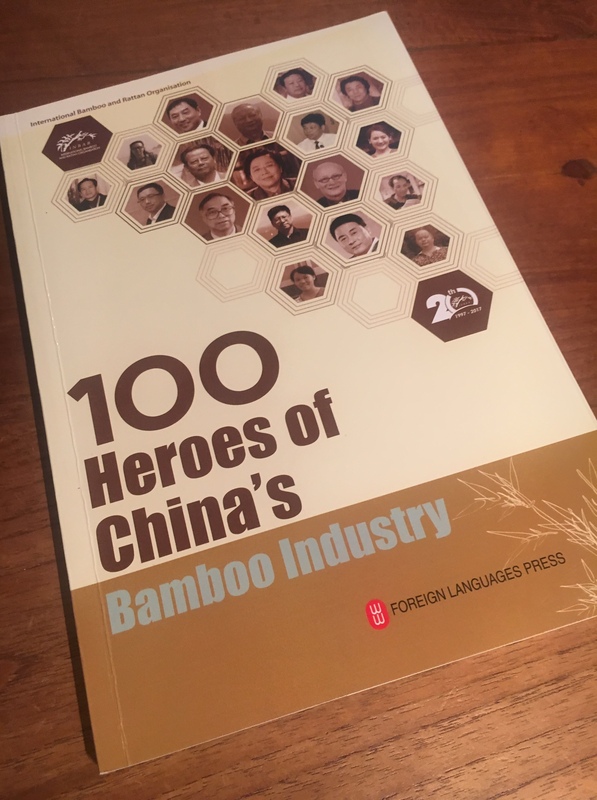 During the 20th Anniversary of INBAR, the Foreign Languages Press from China published the “100 Heroes of China’s Bamboo Industry”. The book is a snapshot of “who-is-who” in the bamboo world of China. Not everyone is mentioned in the book, and a second volume is in the make, but the first “100 heroes” is an impressive list of bamboo luminaries. I have had the fortune to meet several of them, and want to use this blog to reflect on these personal interactions. I have marked the page numbers in the 100 heroes book, where you can read more about the achievements of these amazing men and women. 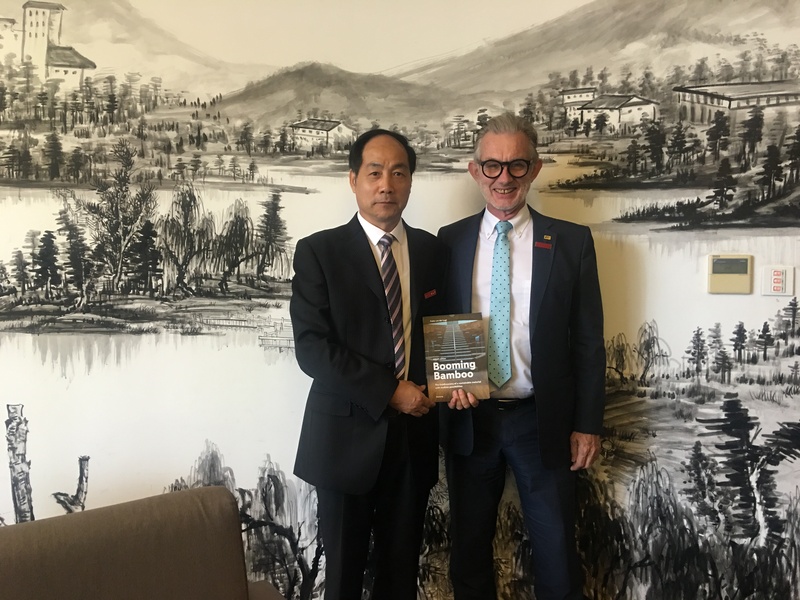 Professor Zhou Guomo (page 25), the President of Zhejiang Agriculture and Forestry University (ZAFU) has become a friend during my time at INBAR. INBAR has been working with ZAFU for a number of years already, and ZAFU was one of the main partners in the development of guidelines for carbon accounting in bamboo. He invited me last year to give a speech at the 70th Anniversary of ZAFU, and it was a pleasure to share INBAR’s experiences with the audience. I always enjoy speaking at universities and the feedback from the students is rewarding and encouraging. This time, the audience included a number of university deans from other parts of the world, and many of them did not know much about bamboo or rattan. I hope that I was able to raise awareness and I certainly helped ZAFU to stress the importance of bamboo in China. During my stay, my wife and I had the opportunity to visit the laboratories and the bamboo garden of the university, and talk with several of the experts. There is a lot of bamboo knowledge in ZAFU, and I hope to maintain contact after I leave China in April this year. 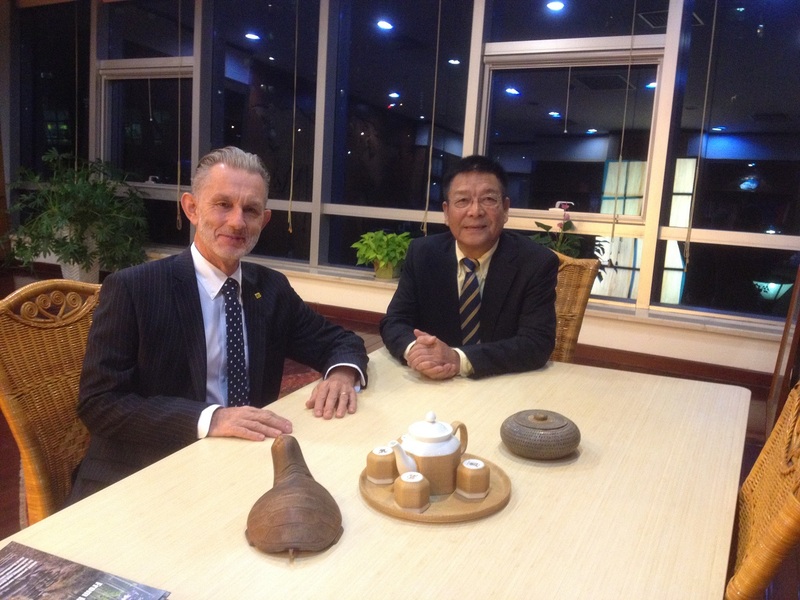 Professor Yang Yuming (page 31), the former President of Yunnan Academy of Forestry in Kunming is another old friend. I visited his former institute a few years ago, and during this trip, he guided me and my wife through the tropical botanical gardens at Xishuangbanna. This is a most impressive garden with an enormous number of trees, plants and flowers, and also an outstanding collection of tropical bamboo species. We saw a valley that is being afforested with bamboo, with the intention to create an eco-tourism site, including restaurants, bamboo rafts on a lake and craft shops. We also visited several nurseries, where he showed me new species and interesting developments. In one of the nurseries, we saw black bamboo, which originates from Vietnam. The stems really are black, and it not due to age or disease. There is a lot of variety in the bamboo world! Mr Ye Lin (page 84), on the other hand, is a real entrepreneur, and a private sector innovator. He is the President of Zhejiang Xinzhou Bamboo Winding Composite Technology Co Ltd in Hangzhou, a company that has patented the use of bamboo fibre in the production of composites for a multitude of uses. The main breakthrough was the manufacturing of agricultural and urban drainage pipes with bamboo instead of other fibres. This research is a major development for bamboo industrial use, that was also reported by UNIDO! I had the pleasure to accompany Ye Lin to the Science, Technology and Innovation Conference (G-STIC) in Brussels in 2017. He presented his innovation and received a warm applause for the new application of bamboo fibres. He told me later that this was the first time that he had given a presentation in a foreign country to an international audience, which made it even more impressive. We went back to G-STIC in 2018, and this time he talked during a session that I had organized together with my Dutch friend and colleague Pablo van der Lugt. 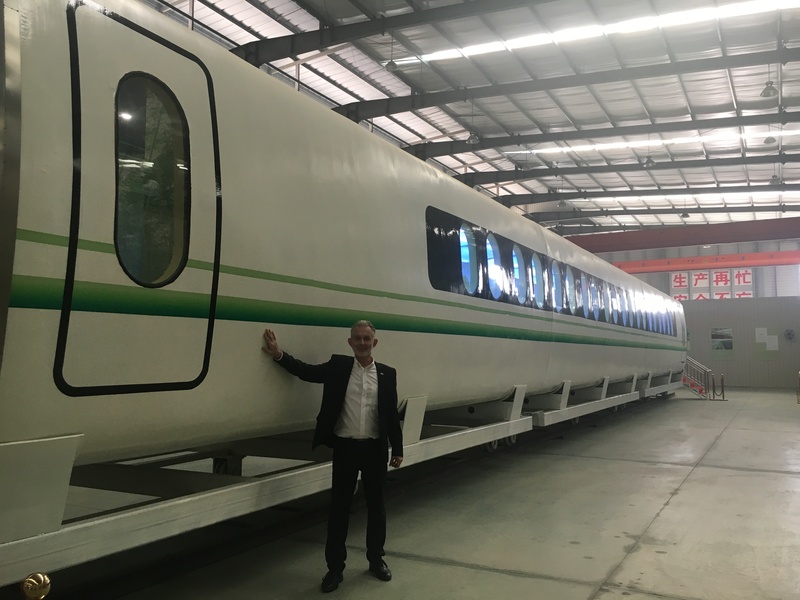 He was no longer just presenting the bamboo composite drainage pipes, but talked about using this technology to manufacture the shells for railway carriages or even housing units. He is already thinking about airplanes, boats and more. Another amazing entrepreneur is Ms Yu Yan (page 119) from Yong’An in Fujian Province. She runs a business that produces the flooring for containers, and she told me that originally the company produced floors made from wood. When Ms Yu became the CEO of the company she decided to change this into flooring manufactured from bamboo, as bamboo is strong, light and abundantly available in Fujian Province. Her business is immense – she apparently provides one quarter of the global container flooring market – so this decision had a lot of impact. I first met Yu Yan in Durban in 2015 during the World Forestry Congress, where she participated in a private sector dialogue about bamboo. She made it clear that for her bamboo is the future, and she mentioned how her company supports thousands of local households who supply the raw bamboo. We have kept in contact, and INBAR now has a partnership agreement with Yong’an City. She has participated in other INBAR events, including the 2018 Bamboo and Rattan Congress that INBAR and the Chinese National Forest and Grassland Administration organised in June – BARC 2018. I met her most recently during the 2018 Yong’An bamboo EXPO. The third entrepreneur that I have to recognise is Mr Lin Hai (Page 107) from Dasso Industrial Group in Hangzhou. 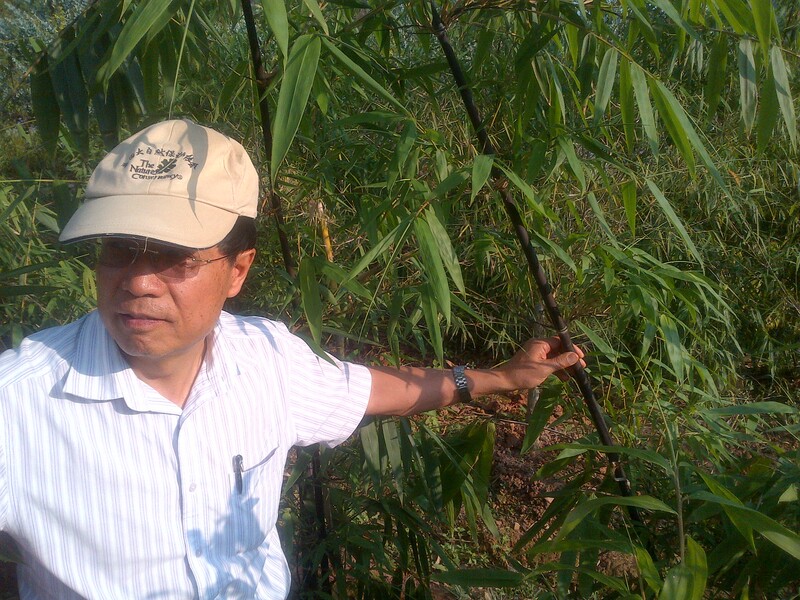 Ms Lin is one of the first businessmen that recognized the opportunities of industrial application of bamboo. Lasso was the supplier of the bamboo that was used to make the fire-resistant ceiling in Madrid International Airport, and currently provides the materials for several European importers of bamboo furniture and interior design material. 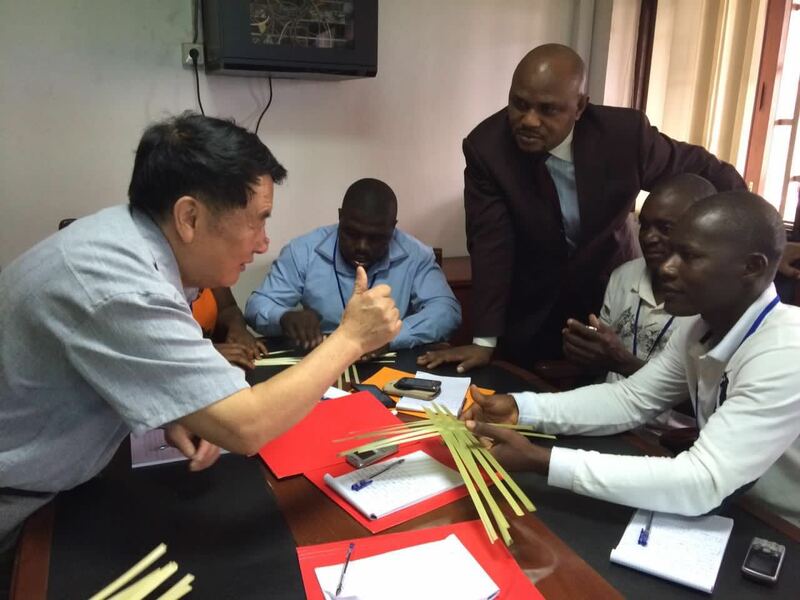 I visited his factory and offices in 2014, and was struck by his passion for bamboo and his understanding of the opportunities bamboo provides for sustainable development. He showed me around the showroom, and I was so impressed that I asked if he could supply a dining table for the apartment where my wife and I live in Beijing, as we did not have one. He supplied a table that is beautiful and strong, but unfortunately it was too large to fit in the lift of our building. We had to find a solution, and it is now the conference table in my office. Due to the dry climate of Beijing, and the temperature changes between winter and summer, many bamboo products crack after a few years. Mr Lin’s table has been in my office which is air-conditioned in summer and heated in winter, but after 5 years it has no dent or crack, which is tribute to the skills of the workers and the quality of the products manufactured by Dasso. Master Chen Yunhua (page 104) is an entrepreneur, but also an artist and a gifted master trainer of the Meishan bamboo weaving craft. He manages a local museum and a training centre in Qingshen County of Sichuan Province, where many students come to learn how to use thin bamboo strips to create magnificent art pieces. I have met Master Chen so many times, that I cannot remember our first encounter, but several of our meetings are memorable. I recall vividly being with him during a discussion in Lima, Peru on the sidelines of the Climate change meeting in 2014, and I saw him in action during the World Bamboo Congress in Damian, Korea in 2016. During the Regional Bamboo Symposium in Yaoundé, Cameroon in 2017, he provided training and advice to a large group of local farmers and entrepreneurs. He is a true Ambassador of bamboo and he has become a friend, and what struck me was that without foreign languages he is able to communicate extremely efficiently, and he manages to get his ideas across without fail. Another Master bamboo weaver is Mr Zhang Deming (page 201), and we celebrated his skills during the 2018 Bamboo and Rattan Congress. I was fortunate to receive a gift of exquisite bamboo weaving from him during the Congress. Basically, it is a ceramic vase with a cover from woven delicate bamboo slivers, like the ones in the photo below. 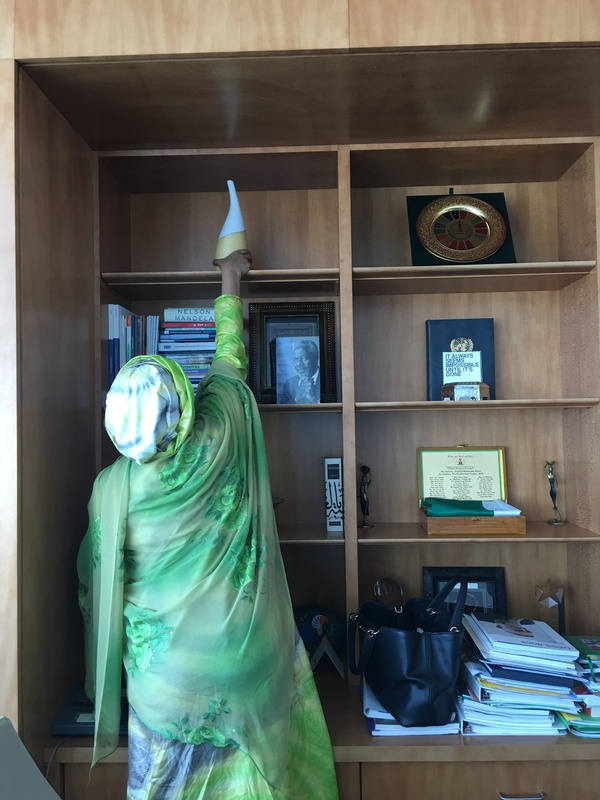 I was so impressed that I asked if I could buy a similar item as a gift for UN Deputy Secretary-General, HE Amina Mohammed, whom I was planning to meet during my presence at the UN General Assembly in New York in September 2018. We had an inspiring conversation about bamboo and sustainable development, climate change, and could have taled a lot longer. When I gave her the vase, she placed it immediately on her bookshelf, where it now functions as a beacon for “bamboo as a tool for Sustainable Development”. A different bamboo artist is Jeff Shi (page 178), who runs Dragonfly Design Centre. Jeff makes the most beautiful bamboo furniture, and his main issue is to make furniture with a Chinese touch. He understands that many people want to buy simple, cheap, mass-produced bamboo cabinets, but he produces affordable custom-made, unique pieces from selected pieces of treated bamboo. His design is a fusion between western and Asian styles, a combination of antique and modern touches, but always focused on individuality and innovation. 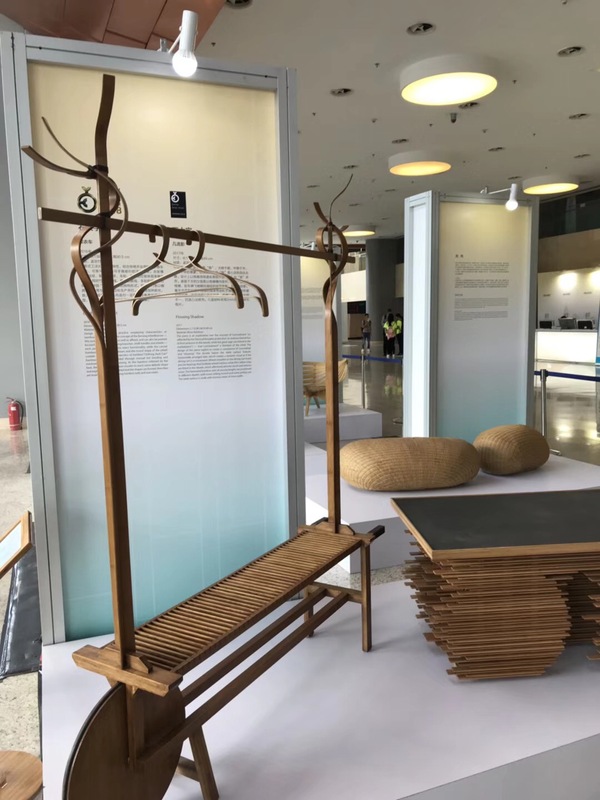 He explained this to me when we first met on the way to Yibin in Sichuan Province, and he refreshed my memory in a session about bamboo for design during the 2018 Bamboo and Rattan Congress. His designs have received international recognition, and he continues to promote the use of bamboo as a real tool for design. One of the first bamboo woodlots that I visited when I arrived in China in 2014 was the Zizhuyuan Park in Beijing, also referred to as the purple bamboo garden. Mr Cao Zhenqi (page 274) is the Head of the Park, which is one of the impressive greenspaces in central Beijing. 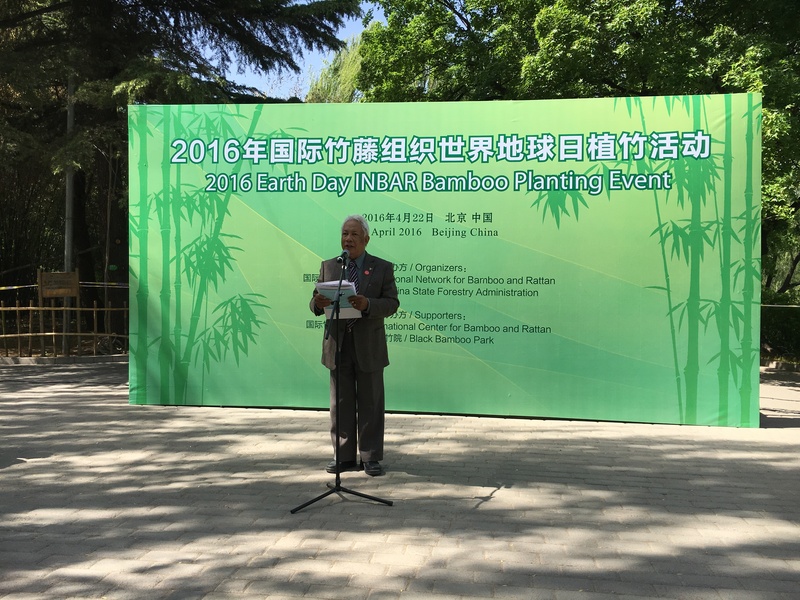 Zizhuyuan Park is famous for the many bamboo stands, with different species, and in 2016 INBAR celebrated Earth Day by planting a few extra bamboos. Many years ago, INBAR helped to construct a tea house in the garden, which is built from bamboo panels. I was quite disappointed when I first visited, as I did not see any bamboo, but my colleagues explained that this is its main attraction. 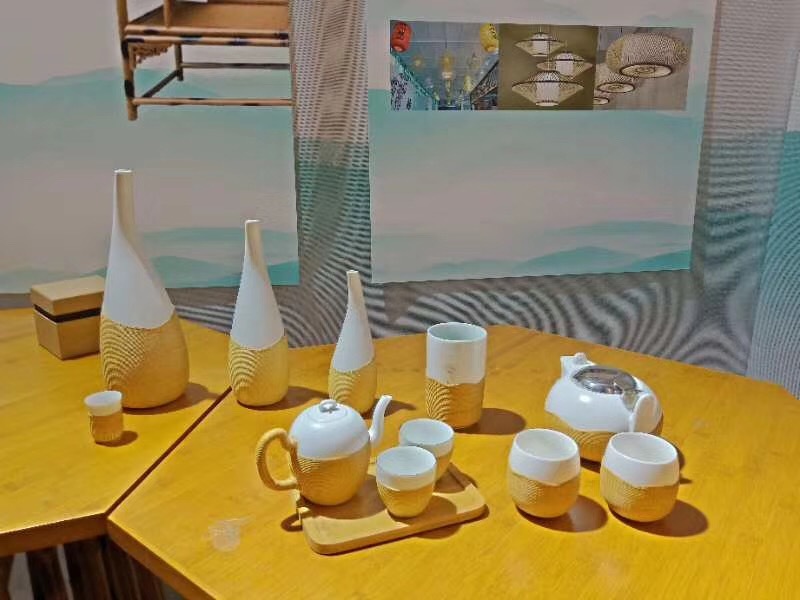 The new middle class of China does not want to live in a house or an apartment that looks like a traditional bamboo hut, but they want a dwelling that looks modern. If you can do this with bamboo, so much the better. 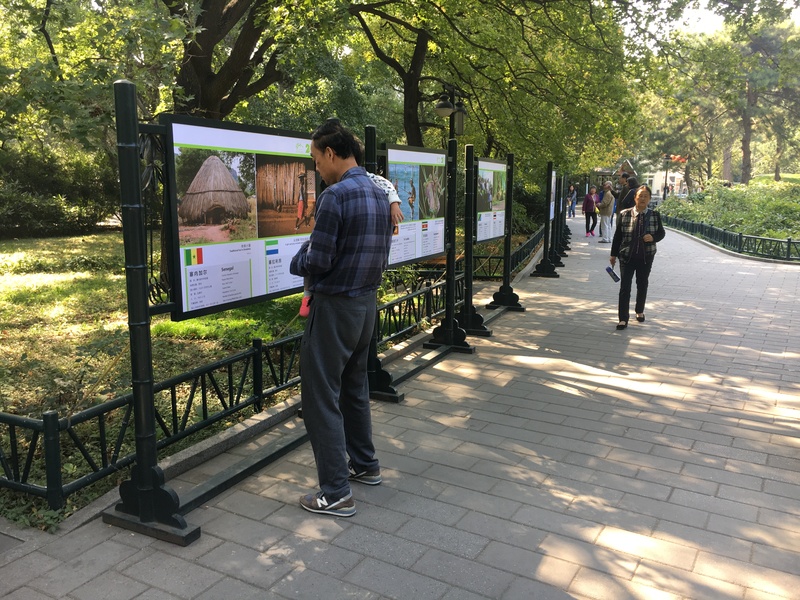 In 2017, INBAR organised an outdoor exhibition of photos of bamboo scenes from all our Member States in the Park, as one of the activities to celebrate our 20th Anniversary. We took a long time collecting, selecting and choosing the final pictures, but the exhibition was a great success. It showed visitors that there is a lot of bamboo in other parts of the world, which was a surprise to many of the tourist in the Park. One of the key benefits that bamboo can provide for national governments is the ability to sequester and store large amounts of carbon. INBAR has carried out research on the ability of bamboo to sequester CO2, together with the China Green Carbon Foundation (CGCF), and Dr Li Nuyun (page 277) was at that time the Director of the Foundation. 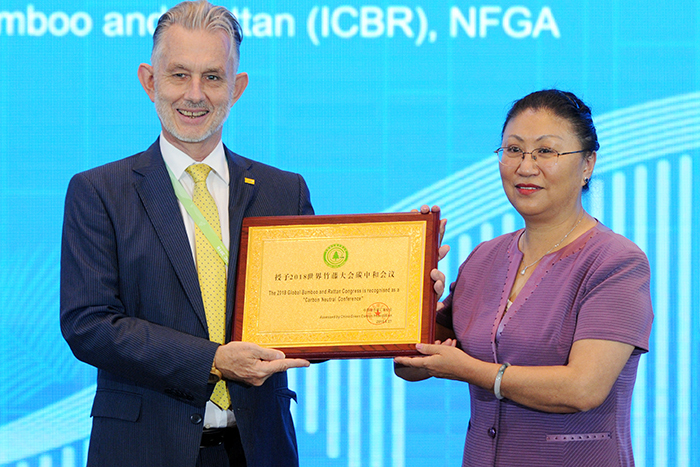 CGCF is the first nation-wide non-profit organisation dedicated to combating climate change in China, and has successfully developed a system which helps enterprises, organisations and individuals to store carbon and increase income. Since its establishment in 2010, CGCF has established more than 1.2 million acres of forest to store carbon across 20 provinces in China. One of my concerns about organising a large congress in Beijing was the carbon footprint of bringing participants from all over the world to China and having three days of discussions in a conference centre. 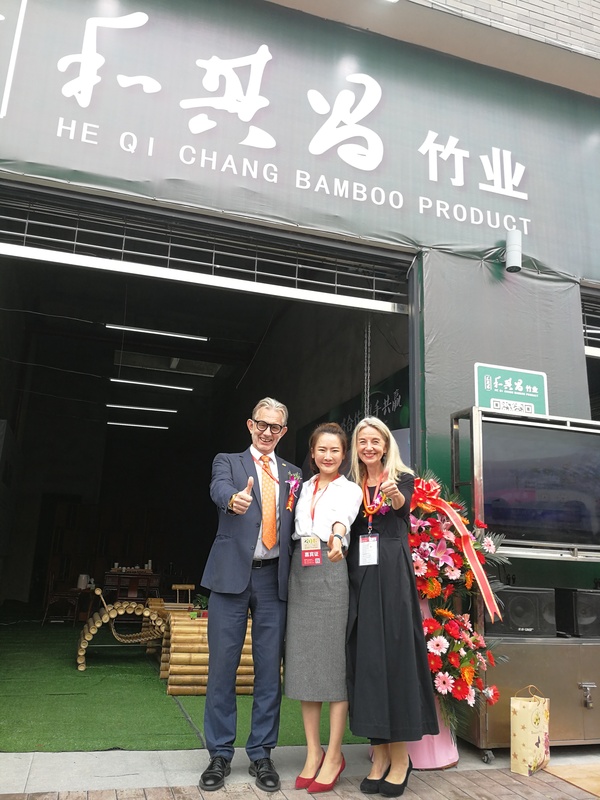 With well over 1200 participants from 68 countries, the Bamboo and Rattan Congress was a huge event with a significant impact on the environment. Fortunately, CGCF helped us to make the Congress a carbon-neutral event. In a ceremony during the final day of the Congress, Dr. Li announced that CGCF will help establish a bamboo plantation in Yunnan province, China, which is funded by Kunming Suge Greening Engineering Company Ltd. This plantation will sequester all the carbon emitted over the course of the Congress. According to Dr. Li, just under 2000 tons of CO2 were generated through transportation, catering, accommodation and energy consumption over the course of the three-day Congress. It will take the bamboo plantation around ten years to offset these emissions. These are some of the Chinese bamboo heroes that I have met during the past years. The list is not exhaustive, as I met so many other bamboo and rattan experts. I will be stepping down as Director-General of INBAR in a few weeks time, but I hope to keep in touch with all these friends and colleagues.